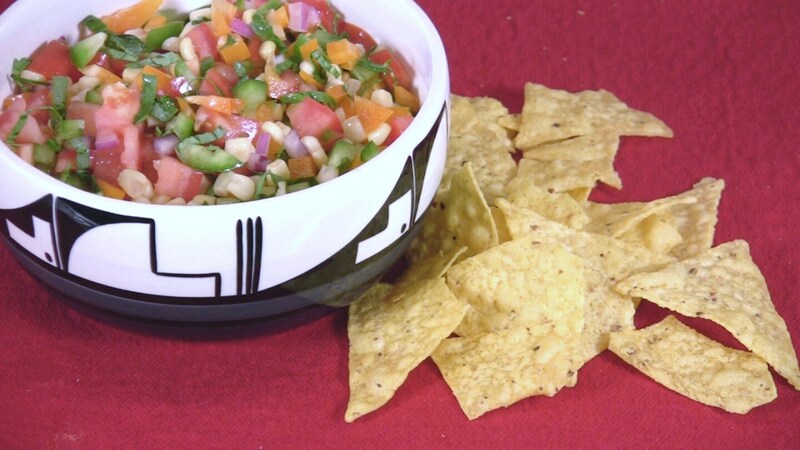 Corn adds fiber, onions supply allyl sulfides, and tomatoes contribute lycopene to this nutrient-rich salsa - all are cancer-fighting ingredients. If using fresh corn, blanch it in boiling water for 3 minutes and immediately rinse it under cold water to prevent further cooking. If using frozen corn that isn’t thawed completely, either blanch it in boiling water for 2 minutes, drain, and immediately rinse it under cold water, or microwave it until thawed. Combine all of the ingredients in a large bowl and set aside for 15 to 20 minutes to allow the flavors to develop. Serve at room temperature. Stored in a covered container in the refrigerator, leftover Colorful Corn Salsa will keep for up to 3 days. Note: For the best flavor, remove the desired portion of leftovers and allow it to come to room temperature before serving. If you are preparing this salsa in advance, wait to add the basil until 15 to 20 minutes before serving, as basil quickly oxidizes. Enjoy this dip with baked chips, stuffed in a burrito, or atop a bed of fresh greens.